Kidney stones can be an uncomfortable and extremely painful experience for anyone who has suffered from them. The pain can range from a dull pain in the stomach to a very severe pain in the lower back and even the inner thigh, and can sometimes be accompanied by nausea and blood in the urine. The National Kidney Foundation reports that more and more people are suffering from kidney stones, with around one in ten of the population in the US likely to suffer from them at some point in their lives. If you have kidney stones or have suffered from them in the past, then please continue to read on about how you can use apple cider vinegar (ACV) for treating kidney stones. However, sometimes the crystals grow larger and don’t get flushed out. They then get lodged in the kidneys and urinary tract thus causing a lot of pain. Calcium Oxalate. This is the most common type of kidney stone and is caused when calcium combines with oxalate in the urine. It can be caused by eating too much foods like potato chips, peanuts, chocolate, beets, and spinach. Uric Acid. This is more common in men and occurs when there is too much acid in the urine and can be caused by eating too much red meat, organ meat, and shellfish. Struvite. Mostly found in women, these can develop into large stones and are usually caused by an infection in the kidneys. Cystine. These are rare and are caused by a genetic disorder. One of the main symptoms that you have kidney stones is pain in your lower back, abdomen or groin area. The pain will usually come in waves and can sometimes be extremely painful. In fact, it’s been described as one of the most painful medical conditions a person can experience. There could also be pain when urinating. Of course, if you experience any of these symptoms, you should see your healthcare practitioner as soon as possible. If you think that you may have kidney stones, then you can use apple cider vinegar for kidney stones as this can help you to start dissolving them. First of all, it is good to know how apple cider vinegar works to dissolve kidney stones. Apple cider vinegar stimulates the production of the alkaline substances and helps the urine and blood to become more alkaline. This results in the breakdown of kidney stones and also helps prevent more stones from forming. Another study found out that that people who consumed fermented vinegar (like apple cider vinegar) had less chances to develop kidney stones. Mix 1 to 2 tsp. raw apple cider vinegar with the mother in a glass containing 6 to 8 oz of water and drink frequently throughout the day. Drinking a mixture of water and apple cider vinegar will help to dissolve kidney stones and flush them out of your body. You can add a little bit of honey to improve the taste and in addition, the combination of honey and apple cider vinegar has a lot of health benefits. You can also add apple cider vinegar to smoothies or you can drink these ACV detox drinks. Drinking apple cider vinegar is not just good for kidney stones, but it also has many other health benefits. 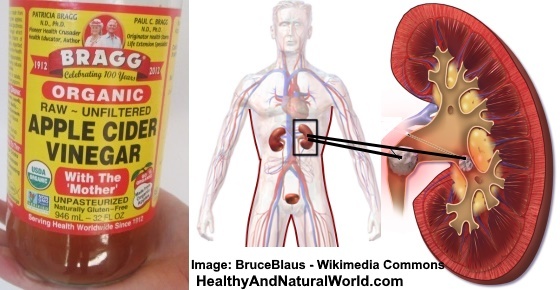 You can also drink apple cider vinegar every day for preventing kidney stones. To do this, mix 1 to 2 tbsp. apple cider vinegar in a large glass of water and drink once a day. The acetic acid in the apple cider vinegar will help regulate your pH levels and help prevent the formation of more kidney stones. You can also use raw apple cider vinegar to make a healthy salad dressing. Just substitute apple cider vinegar for your usual vinegar for your salad dressing. Here is a simple recipe for an apple cider vinegar vinaigrette: In glass mason jar mix together 1/4 cup raw apple cider vinegar, 1/3 cup extra-virgin olive oil, 2 tbsp. fresh lemon juice, 1 minced garlic clove, 1 tbsp. mustard, 1 tbsp. raw honey (or as needed for sweetness), salt and pepper to taste. Seal the lid and shake well until the honey dissolves and the ingredients are combined. Adjust flavor to taste if necessary. Now you know how to use apple cider vinegar for kidney stones, but what else can you do to reduce your risk of kidney stones in the future? One good preventative measure that I have already mentioned is to daily drink a large glass of water with 1 or 2 tbsp. of raw apple cider vinegar mixed in it. However, there are other practical steps that you can take to reduce your risk of developing kidney stones. Lemon juice contains citric acid which affects the body’s pH levels in a similar way that acetic acid does. So, this means that the citric acid in lemon juice will also reduce acid levels in the urine and thus reduce the risk of kidney stones. Use the lemon juice the same way you use apple cider vinegar, and make sure that you always consume raw lemon juice form juicing lemons yourself. Don’t use bottled lemon juice that you find in the supermarkets, as these products are usually pasteurized and don’t contain their enzymes and nutrients. Add it to smoothies, salad dressing, and warm water. There are also many other health benefits for drinking lemon juice mixed with water. If you prefer to put lemon in your tea, you can use my recipe for a cleansing ginger lemon tea. It’s important to keep well hydrated. But, to prevent kidney stones is it more important to make sure that you pass a lot of urine during the day. This is especially true in the hot weather or when engaging in strenuous exercise. This is because the more you sweat the less water passes through your kidneys and this can lead to a buildup of the minerals which form kidney stones. You should drink enough so that your urine is always light and clear. See more information in my previous article on what your urine can tell you about your health. Salt can increase the chance of developing kidney stones because it makes the kidneys excrete more calcium which then combines with oxalate in the urine to form stones. Make sure you are aware of the warning signs of consuming too much salt. Mayo Clinic recommends to eat fewer oxalate-rich foods such as rhubarb, beets, okra, spinach, Swiss chard, sweet potatoes, nuts, tea and chocolate if you tend to form calcium oxalate stones. However The National Kidney Foundation claims that it is a common misconception that cutting the oxalate-rich foods in your diet alone will reduce the likelihood of forming calcium oxalate kidney stones. The foundation claims that in theory this might be true, but this approach isn’t smart from an overall health perspective as oxalate is naturally found in many foods, including fruits and vegetables, nuts and seeds, grains and legumes. Since most kidney stones are formed when oxalate binds to calcium while urine is produced by the kidneys, the foundation recommends instead to eat and drink calcium and oxalate-rich foods together during a meal. In doing so, the oxalate and calcium are more likely to bind to one another in the stomach and intestines before the kidneys begin processing them, so it is less likely that kidney stones will form. The two most common types of kidney stones are calcium oxalate and uric acid. As I mentioned above, if you have calcium oxalate stones you should eat calcium-rich foods together with oxalate-rich foods. This helps the calcium and oxalate to bind together in the stomach rather than the kidneys. 3. Journal of Mass Spectrometry. 4. National Kidney Foundation – ways to prevent kidney stones. 5. Can lemon juice treat urinary calcium stones? 6. The effect of lemon juice on urinary lithogenesis. 7. Diet for kidney stone prevention. Excellent article!! Thank you, thank you, thank you…..! I used the following recipe to dissolve kidney stones: 2tsp of apple cidar vinegar plus 1 tsp of baking soda in 1 glass of water 3 times a day. I had a bad stones, my kidney was blocked. After about one month I was free of trouble. It worked.